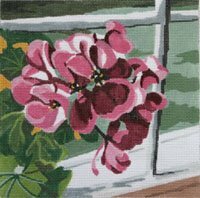 Geraniums in red and pink colors at your windowsill by KAMALA. This canvas is offered by JulieMar. Measures 5 x 5 on 18 mesh. If you want to keep this canvas taut while you stitch it then we recommend mounting it onto two pairs of 9" stretcher bars with some thumb tacks.